A House is not a home without a Pug. After a lifetime of living and working with dogs ...representing one of the leading British based animal feed companies for Germany Austria & Switzerland, we have come to the conclusion that it is of paramount importance to breed for health & subsequently 'happiness'. in our cosy little....Mopszucht...and endeavor to breed to the best of our knowledge and from the best dogs that we are aware of. putting long term health issues to the top of their breeding criteria and would like to commend their dedication for the future of this wonderful breed. Furthermore we feel we owe it to the dogs we breed to pass them on to like - minded and responsible people who will ultimately own a unique loving ,charming companion who will put a smile on your face for the rest of their lives. who, after settling in here, will be carefully prepared for selective stud duties. 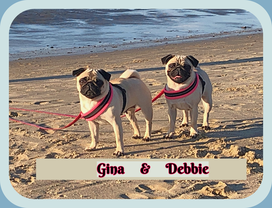 PS....we will be pleased to help with any Pug matters....we speak English and German.